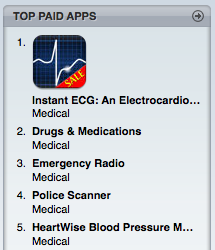 Individual app shoppers also find Instant ECG to be the best electrocardiogram reference as the app continues to be the Top Paid Medical App on the iTunes App Store. 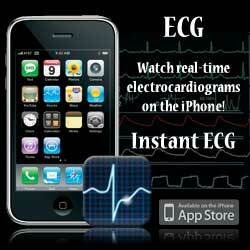 A new iPhone app called Instant ECG has been listed on the iTunes App Store today! It can be found under the Medical subcategory. Use the following link to download Instant ECG. Version 1.0 covers the most important 30 ECG rhythms to learn. We are accepting user submissions of the best 12-lead example of each rhythm and will expand the current program to include electrolyte abnormalities, drug effects, pacemakers, and other cardiac disease in the next version. Upgrades and Version 2.0 will be FREE. 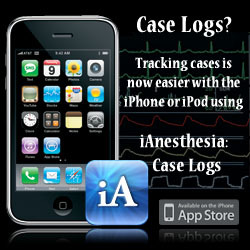 Today, iAnesthesia LLC has submitted our new iPhone app, Instant ECG, to Apple. It will undergo a review process and hopefully in the next few days become approved and listed on the iTunes App Store. Version 1.0 covers the most important 30 ECG rhythms, has over 150 exam questions, excellent reference artwork to clarify concepts, and an ECG basics section to teach the foundation of electrocardiogram interpretation. Submission of version 1.0 marks the end of one stage of development, however iAnesthesia is committed to constantly improving Instant ECG. For version 2.0, we plan to offer multiple 12-lead examples of each rhythm. If a user has a “best 12-lead example” they would like to submit, please do so using the Contact the Support Team form. Instant ECG will also expand the rhythms to include electrolyte abnormalities, drug effects, pacemakers, and other cardiac disease in the next version. Our commitment to you is FREE upgrades for the life of the program. iAnesthesia LLC would like to announce that Instant ECG, a new iPhone App to help teach ECG rhythm analysis and identification, will be coming to the iTunes App Store soon!